This week in nonviolent history commemorates the successful conclusion of Kuwait’s Blue Revolution. On May 17th, 2005, Kuwaiti women gained suffrage after more than 40 years of struggle. The women used a wide variety of approaches to achieve their goals, including lobbying, introducing repeated legislation, protests and demonstration, marches, rallies, and mock elections. 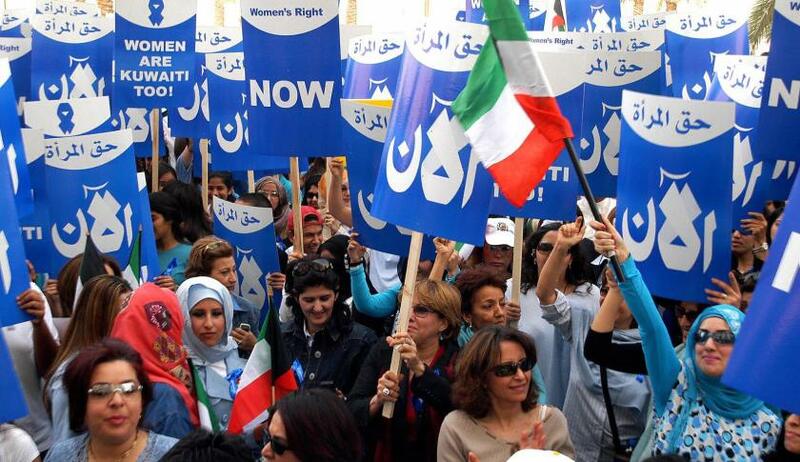 Like many women’s suffrage movements around the world, the Kuwaiti women escalated their actions and campaigns, shifting from legislative and legal efforts into nonviolent direct action. The history of their multi-decade effort is complex, spanning from the 1960s when Kuwait won independence from the United Kingdom, through the Iraqi occupation in 1990-1991,and onward another 15 years until a series of nonviolent actions, changing political climate, and increased pressure finally won the vote for the women of Kuwait. In March of 2005, after highly visible and captivating actions, 1,000 demonstrators gathered outside of the Kuwaiti parliament to continue their demand for basic voting rights. 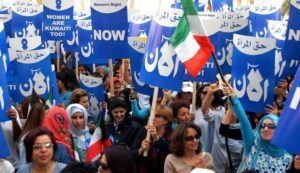 Many women wore pale blue to represent the struggle for suffrage, leading to the moniker, “The Blue Revolution.” On May 17th, Kuwaiti parliament passed the long-awaited suffrage bill, granting women the right to vote and run for elected office. 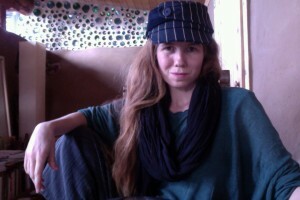 The Blue Revolution is part of the Color Revolutions, a series of nonviolent movements that erupted from the 1970s to present day, with a peak in the late 90s and early 2000s. These movements include, the Carnation Revolution in Portugal, the People Power Revolution (also known as the Yellow Revolution) in the Philippines, the Velvet Revolution in Czechoslovakia, the Rose Revolution in Georgia, the Orange Revolution in the Ukraine, the Cedar Revolution in Lebanon, the Denim Revolution in Belarus, the Green Revolution in Iran, among many others. The use of identifiable colors and symbols was often used as an intentional tactic of solidarity and visible protest.